Loaded with features but without all the flash of the Urban Grey series, the standard black P-09 Suppressor-Ready now comes with high night sights and extended magazine bases in addition to the obligatory extended, threaded barrel (1/2×28). 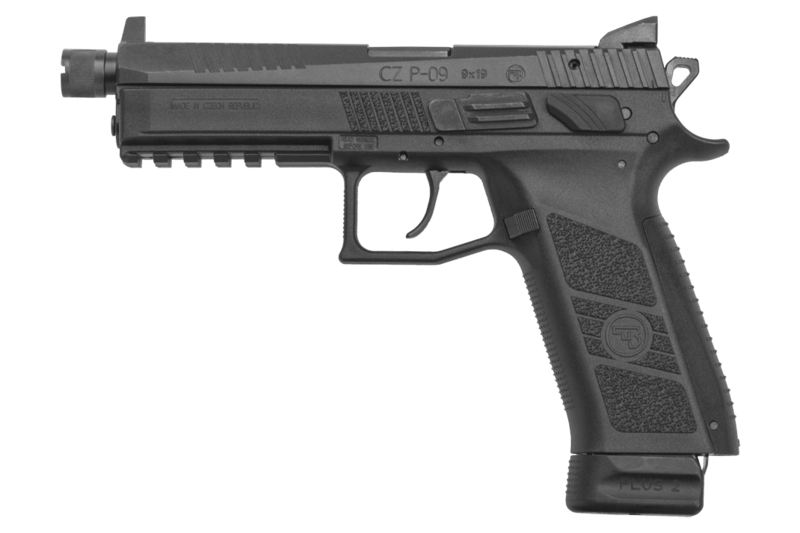 The P-09 is our full-size polymer offering, with the extended mags of this special model fitting 21+1. Featuring the versatile Omega trigger system, the P-09 is shipped with decockers installed but can easily be converted to a manual safety with the supplied parts and instructions. Also included are small, medium and large backstraps that allow the user to customize the pistol’s grip to their hand while retaining the natural point of aim that CZ handguns are known for. With an integrated 1913 Picatinny rail, the P-09 is readily adaptable to low-light situations. The Omega DA/SA trigger provides crisp single action trigger break, while providing the safety of a DA first-pull option.